There are a lot of things we'd like to experience at Hogwarts. We want to talk to the animated portraits, hang out with the long-dead ghosts, and try out for Quidditch practice. We also still have dreams about taking notes in Transfiguration, charms, and Potions (especially as a Slytherin student). You know what we wouldn't relish about living at Hogwarts? We're sure that ancient castle would have some serious drafts and chills! You wouldn't always be able to get that spot right next to the fire. Make sure you're ready to study in comfort with this super soft Slytherin robe. This lovely fleece robe is printed with the Slytherin shield as well as the striped green uniform tie. You'll make Snape proud when he sees you studying while still looking like a modern student. This Harry Potter is officially licensed, making it the perfect gift for all those ambitiously smart Hogwarts students out there. We're sure learning about magic, charms, and potions really takes it out of you. Make sure you're ready to curl up at any time with this blanket like Slytherin robe. 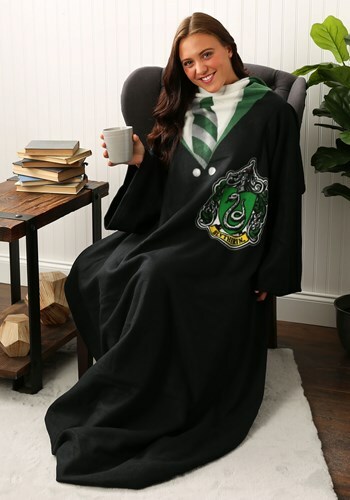 Whether you're gifting this to a Harry Potter fan or you're embracing your Slytherin nature, this robe is sure to be a hit!